Online video storage, editing and management service StashSpace will make a full public launch and media press on Wednesday. Unlike the many services we see focused on short form video, such as Jumpcut (a Yahoo! acquisition) for editing and VideoEgg for online capture, StashSpace lets users work with long movies in the browser. It’s easy to use, has a good pricing structure and targets a clear pain point in a large market. Shutterfly’s $87 million IPO last week was further evidence that easy online multimedia storage for non technical users is a market ready to take flight. Users upload video of any length through the StashSpace website, then select clips they want to save with a workspace built as an ActiveX plugin. Saved footage can be edited, shared and viewed through the site. It may not be the flashiest company online, but I think StashSpace’s strategy is smart given the direction the consumer video market is going. Founded by John Larsen, Lars Krumme and Steve Smallman, Stashspace is based outside of Seattle. The company is self funded from the co-founders tech work in the late 90’s and the last 7 years of revenue from their related site, homemovie.com. StashSpace is the fourth major iteration of the company’s software, now updated and rebranded for an era of ubiquitous broadband and inexpensive online storage. One of the key differentiators is that the company will digitize, transcode and put online video tapes for $5 each. This is much less expensive that most of the company’s competitors – they say it’s an unusually automated process for them. DVDs can be purchased for $15 with personalized covers made for an extra $4. Krumme told me that they believe there is a huge market in analog video that non technical users would like to digitize, put online, edit and share. Making this easy and cheap sounds like a great strategy to me. Prior to this launch targeting consumer users, the company’s primary distribution channel has been through wedding videographers and newlyweds. Consumer video creation is becoming popular enough now that it makes a lot of sense to expand that user base and most services are still focused on short form. Making themselves known will probably be the company’s biggest challenge. 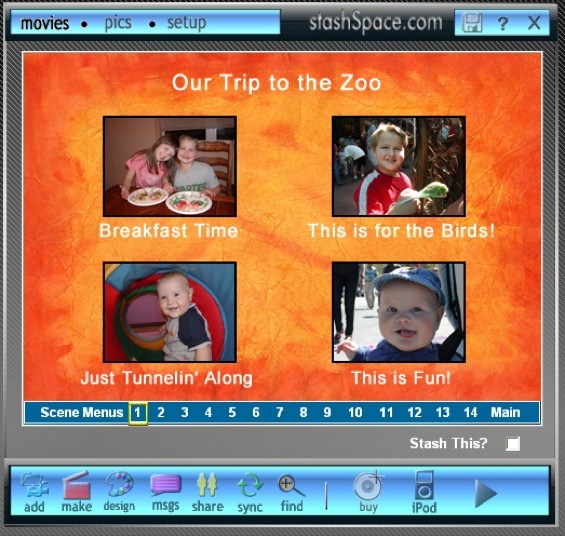 The StashSpace editing function is very nice, 100 screen caps are created for each video uploaded from the web, users then clip sections from timeline marked by those screen shots. The clippings can be dragged onto a clip board, a new screenshot and title can be selected from each selection. It’s easy to copy video segments from one file into another, add photos and captions. It’s a very smooth online editor that’s suitable for big files. The software supports tagging, which I believe is great for navigation even for non-technical users. Storage is paid with through tokens that cost between 25 and 40 cents per 5 minutes. That means that online storage of an hour’s worth of video comes to at most $8 per year. Users get free tokens for doing things like sharing video and trying new features; downloading video to iPod format costs 1 token. Serving up unlimited video files in Windows Media format is free. There’s also a widget that can be used to display your videos on social networking sites. The service is primarily for Windows/IE right now, though there is some basic Mac and Firefox support and full features are scheduled for early next year. I’ll be much more interested in using the service when this is the case, but the world is as it is and Windows only isn’t going to stop them from doing well in sales. There are a number of competitors for this sort of function, but the primary one targeting users interested in easy, long form online video editing is probably OneTrueMedia (our coverage). OneTrueMedia’s interface is quite different, their prices are higher, they have venture backing and more commercial partnerships online with sites like Johnson and Johnson’s BabyCenter.com. I think the analog to digital conversion, editing and DVD making market is probably more than large enough for both companies to do well. StashSpace’s pricing may pressure its competitors though and that would be good. Disclosure: StashSpace was a sponsor of the TechCrunch 7 party.